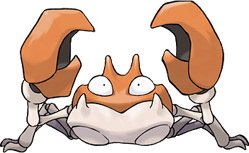 Crab pokemon. Only ever needed one water type, so yeah. An even simpler treatment is calling this a... 5 point unusual background that gives the option of customizing any damaging attack that normally has an affliction property by removing the affliction, and instead increasing damage by up to 30%. A strong grappling attack. Consider the Power Grappling perk from Martial Arts, p. 51. Take up to 8 levels. The benefit lasts for 1 minute. This is Horn Drill by another name. This is like Stone Edge, but with a cutting attack instead, and it can go up to 5d damage. Take a lot of levels if you wish. Volunteering today, so I actually finished this one ahead of time. Hooray. Had to shuffle around a lot of normal life to make it fit. Might be running a game tonight too.